My data consists of two predictors, one with 3 responses (time at exposure) and 1 with two responses(gender. I can do a log reg just fine and I cross my two variables, but I'm not sure how to interpret my OR's, . I want to know: OR for early exposed females. How do I get that? Is that already in the table, or do I need multiply the OR for females with the OR for early exposed? And if it's already in the table, how do I get early exposed males? appear to show what to do. I might be wrong, but is sounds like you should include as a predictor the cross between time and gender. It will have its own odds ratios which is what you are looking for. It is entirely possible that you might be able to derive that from the odds ratios for the two predictors alone (although I doubt it), but I'm not smart enough to know how to do that. But I think I already did that? 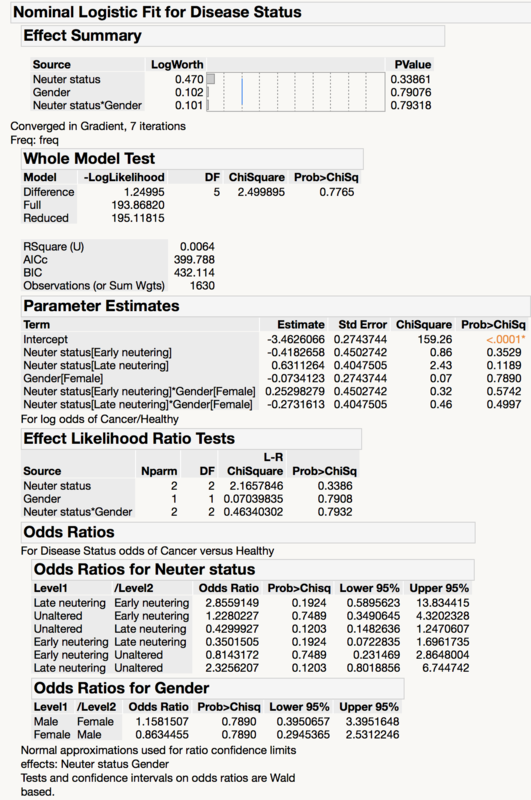 I have 3 model effects: Gender, Exposure status and gender*exposure status, and I don't get any ORs for that. I get parameter estimates and effect likelihood ratio for it though, that's why I thought I might be able to calculate it. It might also be a part of the given OR's I just can't figure it out. This is the OR output, but where is female-late neutering against unaltered? Well, thank you so much for those links, they're exactly what I need!